Editor’s Note: I’m on vacation this week, so I’ve asked Kirk Williams to fill in and blog for me. You’re going to love this entertaining and thought-provoking post! The word strikes fear in my heart. Let’s call it a hopeful fear. Or maybe a fearful hope? Attribution is amazing and powerful and awesome but we’re (I’m) still trying to figure it out, right? Like the cookie jar just out of reach of the grasping toddler hands, attribution is something I often can’t get my mind around when it comes to making actionable account decisions. Now, before all you “I understand all of everything everywhere for all time” people hop in with your buzzwordy explanations, I don’t mean that I don’t understand the concept and importance of attribution. I get it, attribution is essential for business survival. Last-click needs to rightfully die. 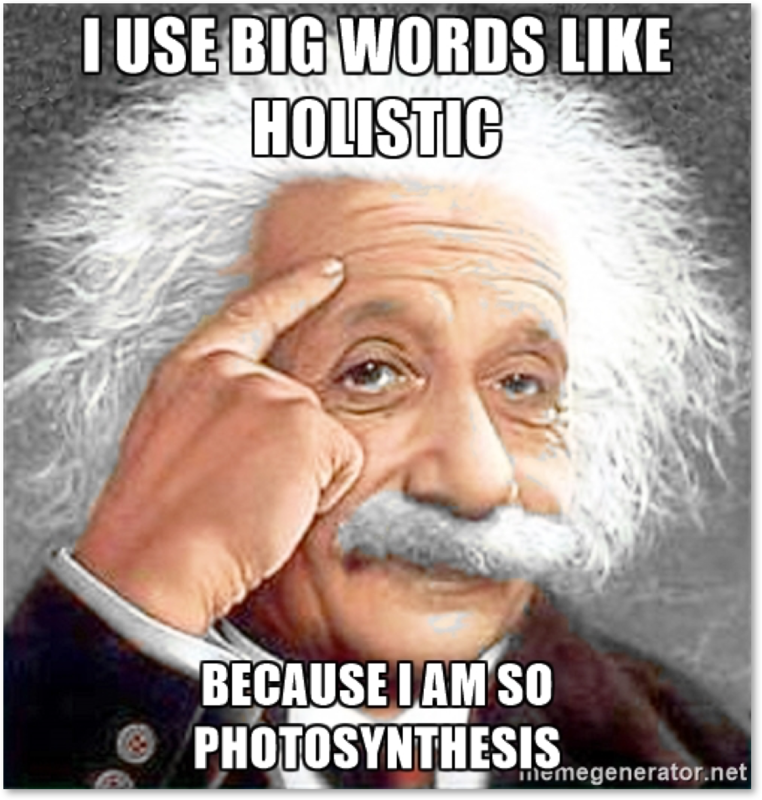 A holistic marketing approach (buzzword alert) needs to rightfully arrive as the savior of PPC efforts. What I mean is that I can’t always grasp what to actually do in my account with the attribution information I receive. OK, so X campaign had a touch on 30 other conversions last week. Report to client, check. Uhhhhhh…. now what? 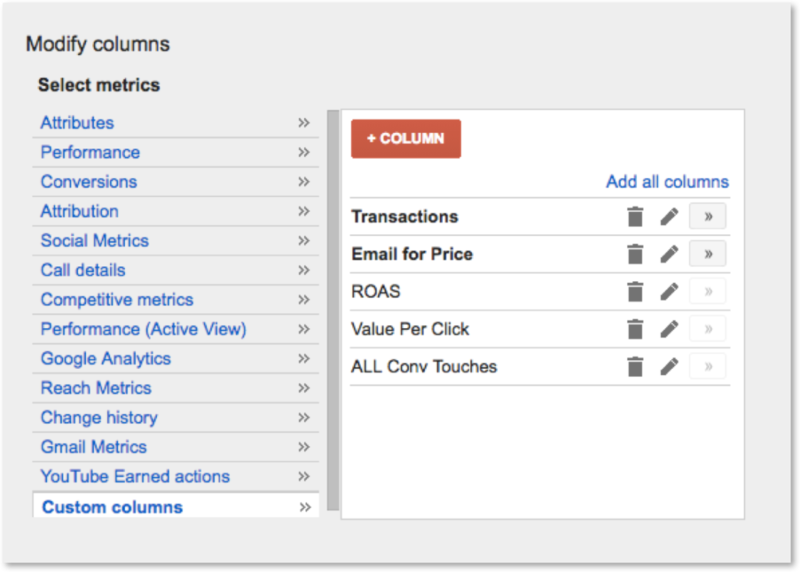 When it comes to making decisions in my accounts, the AdWords UI still reigns supreme. Thankfully, they have been stepping up their game in terms of the data we can utilize in our columns. The reason why columns are so important for me, is because I use them as my primary way of rapidly observing, analyzing, and acting upon data. In the recent past, Google added attribution into its columns as another signal we could use to make better decisions. I believe there is a way to use this attribution data for better decisions, and we’ll cover that, but I want to note one thing first. Qualification: If you are looking for a specific formula in this post, you’re not going to find it. There are great bidding formulas out there (read Wijnand Meijer’s massive tome on bidding here: The Complete AdWords Audit Part 13: Bid Management), that discuss scientific formulas and brilliance beyond my capabilities. Perhaps someone will even read this post and figure out some scientific formulaic way to do what I discuss here (Great! Share if you do, please!). My purpose in this post is less to provide a formula then it is to plant an idea. I want to get your brain thinking about how you can actually utilize attribution for bidding decisions in one way, and then to apply that in your accounts as you see fit. Good to go? No more qualifications? 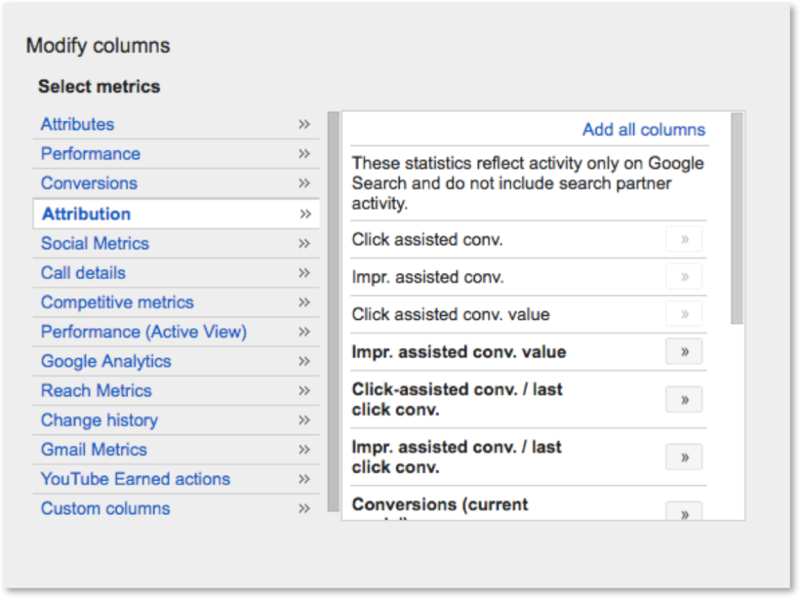 Utilizing custom columns and attribution columns to broaden my understanding of conversion impact in AdWords is one example of a way I use attribution to take a tangible, specific, action in my accounts. 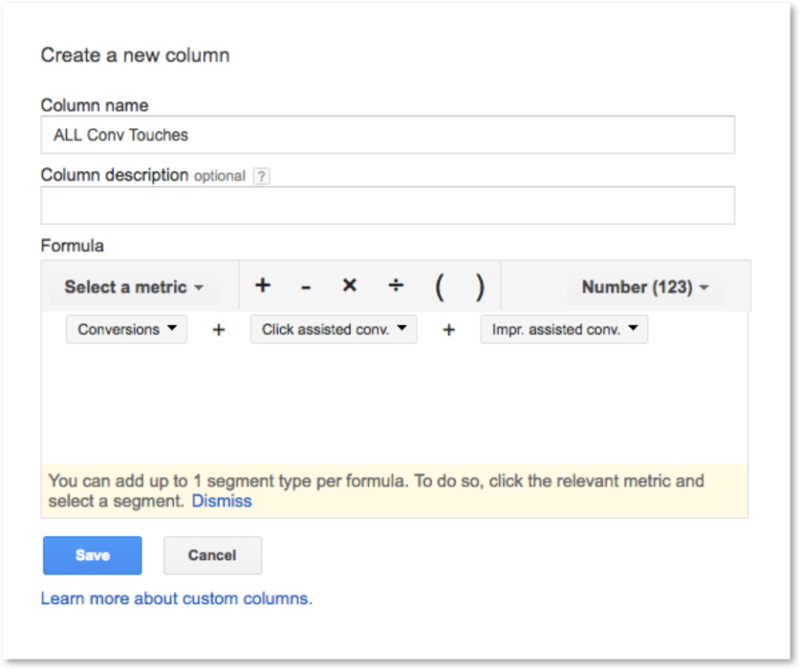 STEP 1 – I go into AdWords and select the attribution columns for click assisted conversions and impression assisted conversions. It may be helpful for you to include the click assisted conversion value (revenue) as well. STEP 2 – I create a custom column for “All Conversion Touches” in which I add Last Click Conversions, Click Assisted Conversions, and Impression Assisted Conversions. This helps me see at a glance, how much of any sort of conversion impact an AdWords element has. Yes, you are correct, but please stick with me. I think it may make sense later why I believe it’s ok to lump these together. Make sure to add in the Custom Column to your Dashboard (I like to add it in last). STEP 3 – Pull some data, and analyze it. As an example, take these Shopping campaigns I pulled from a client (with permission to show them to you). This should give you an idea of what the data actually looks like right in the UI where you can see it. See how the attribution columns broaden our understanding of the impact on our campaigns? Cool, huh? But…. what do you do with this? That’s the question we started out with, right? How will this actually help you make a decision to bid, set a negative keyword, pause an ad group, or a myriad of other optimization actions at your fingertips? Here is where the rubber meets the road. How are you actually going to make a bidding decision in which attribution was taking into account? Well, by working some advanced formula into something, RIGHT??? JUST GIVE ME A FORMULA, KIRK. Nope. You’re going to guess. Now, before you tar and feather me, please allow me to defend myself with this scenario. You have sorted your top spend ad groups in AdWords, and are trying to figure out where to prioritize your time. Maybe you even use a filter (because you are a top-notch PPCer) to highlight the ad groups that have brought in $0 total conversion value and +$300 spend. When you apply that, you see 5 ad groups in your view. Here’s where it gets interesting. Because you are a holistic (there’s that word again) marketer, you are keeping one eye on your attribution and custom columns and you see something fascinating. Of those evil 5, 2 of those ad groups are showing strong click & impression assisted conversions. While the last click conversions are at 0, the click and impression assisted conversions are through the roof on these 2 ad groups. It’s interesting (you surmise to yourself), because those ad groups are of keywords that are probably more top of funnel in the sales process anyway, so perhaps it makes sense that they are assisting without directly converting. Armed with this new knowledge, you decide you are NOT going to pause these 2 ad groups. Instead, you start digging around a little more, try a new ad test, perhaps raise the bid 5% (just to see what happens). You just took action in your account based on attribution data. Without this attribution information, you would have most likely reduced bids, or even paused those keywords/ad groups that are providing a significant source of top-of-funnel, brand-introduction traffic. THAT, ladies and gentlemen, is using attribution to actually affect the way you manage an account. I’d like to point out something else. Another thing this is doing, if you didn’t notice, is empowering you to make a smarter decision. There’s not a formula, because it’s kind of a squishy thing, right? In many ways, the attribution data (and our understanding of it, and how we can apply it, and…) we get is still squishy. 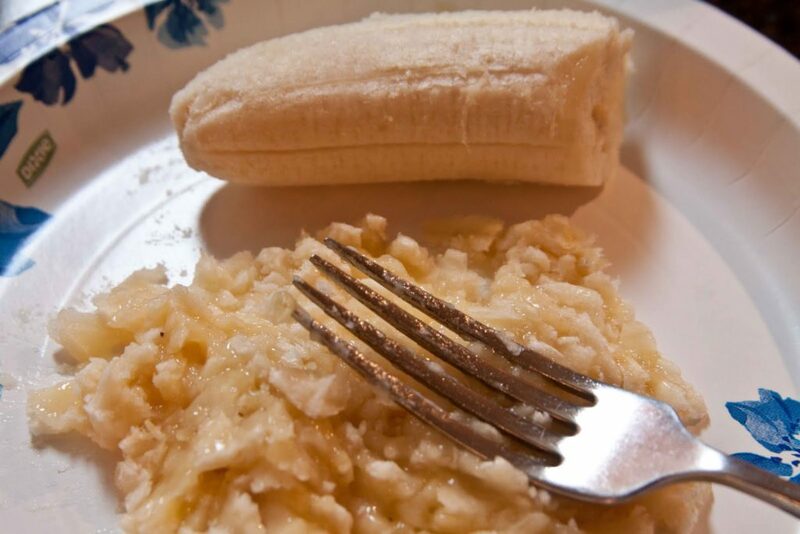 So if you try to set a hard rule on squishy data, you get something that resembles this smushed banana more than it does a great new automated bidding adjustment. That’s why I said it’s basically a guess, and that’s why your value as a PPCer is still there. In my opinion, the squishiness of data is where the truly great (human) PPCer will shine (or fail miserably, we’ve all done it). You have all this data, but what should you do about it? A smart PPCer who really knows his/her account, will be able to make a great decision based upon that data and intuitively know whether to try to limp that keyword along a little more, kill it off, bid it lower, or even expand its presence. This means you can breathe a sigh of relief, the robots haven’t won quite yet. So, while I don’t have a formula for what to do here, hopefully I’ve armed you with a little more knowledge moving forward to make better, smarter bidding decisions in which you are beginning to think beyond the last click conversion for the good of your account. There are likely many ways you can think of to use attribution in a tangible way, great! Please share them in the comments below. Kirk Williams is the owner of ZATO, his PPC Marketing agency and has been working in Paid Search since 2010. He has published articles on Search Engine Land, Moz, PPC Hero, Wordstream, and the Bing Ads blog, but is probably more well known for the dumb PPC memes he shares on Twitter. In 2015, Kirk was named 1 of the Top 5 Rising Stars of PPC and in 2016, he was named the #7 Most Influential PPCer by PPC Hero. Kirk loves to talk PPC and has spoken at SMX, Hero Conference, SLC Digital Marketing Conference, and State of Search.